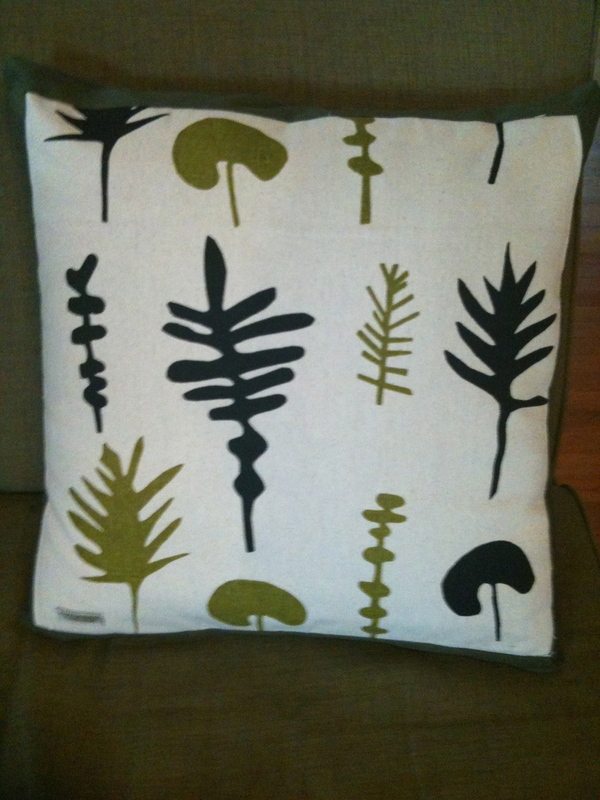 While vacationing in New Zealand, I found two great tea towel designs by New Zealand designer Ingrid Anderson (http://www.iatextiledesign.co.nz/showcase/index.html), that would make wonderful cushions for my kiwi green sofas. I had the idea, but realized that I had not sewn since high school (over 20 years ago) and did not have a sewing machine. As projects stacked up, I bit the bullet ( so to speak) and purchased my first sewing machine a couple of months ago. 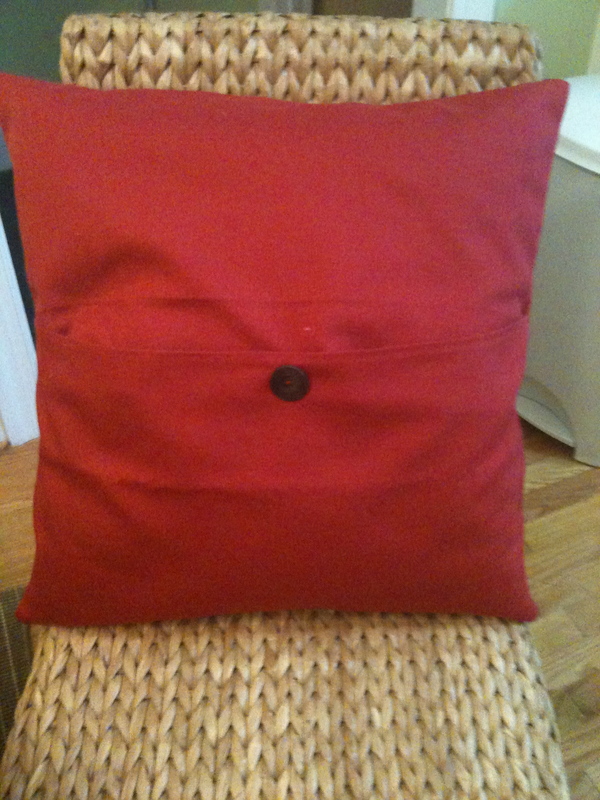 These cushions would make a great first project and I had the materials for 4 cushions, one set were red and the other green…..so here’s what I did. 18 in. by 18 in. First step was to sew the border pieces around the tea towel square which is to be the center. You will want to do each border one at a time; when you have two sewn on you will do a miter corner to connect the borders and give it a nice finish. Then add one border at a time and corner till finished. Make sure you iron the borders and corners. That’s the front side of your cushion and should measure 21 in. x 21 in.I found a great youtube video showing how to do easy miter corners for the borders – if I find it again I will update the blog. Now for the back…I took each of the two 13 in. x 21 in. pieces and on one of the long sides (ie. the 21 in.) I pinned about 1/4 in. over. I ironed this seam flat. I folded over again 1/4 in. and re-pinned and ironed again. Now it is ready to sew a 1/4 in. seam starting and finishing with a few back stitches. The last step, sewing the cushion pieces together. Place the front piece tea towel up (so you can see the print). Now place one of the 13 x 21 in. pieces front down and line up the long rough edge to be at the top of the front piece. Repeat with the other 13 x 21 in. piece except the rough edge will line up at the bottom of the front piece. 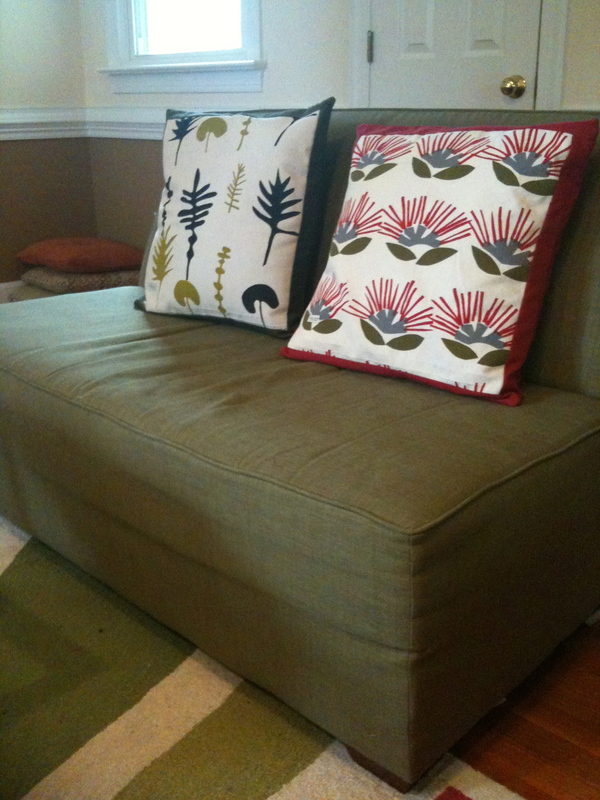 Pin in place – make sure you pin the overlap correct so that all pieces are seamed together.NOTE: If you have pinned correctly you will see all the inside of the cushion – no pattern should be seem. Remember you will be inverting the slip once sewn. Sew 1/4 in. seam around all 4 edges in one step. Start on one edge and when reaching the corner, pause, lift foot and change the direction of the fabric to sew the next edge…continue until seams meet. Also as you sew the two sides – check that the seams of the overlapping edges are included.NOTE: I always start and end my seams with back stitches to avoid any unravelling of the seams later. 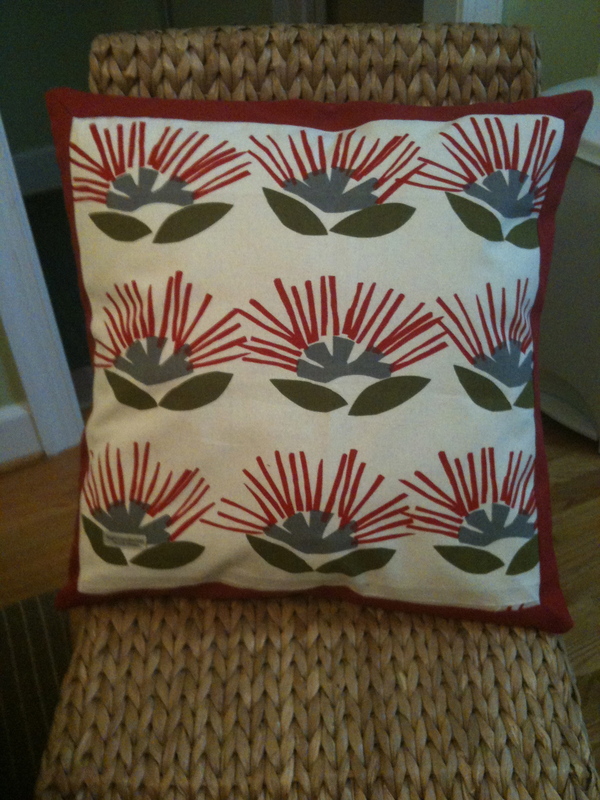 Once complete iron all seams, invert your cushion slip and I iron again to get the look I want. Now slip in the cushion – and you are done. I found that the cushion slip held fine without buttons but if you are feeling more creative add a button-hole on the outer most 13 x 21 in. piece and a button on the inner one. This entry was posted in Uncategorized and tagged crafts, cushions, dish towels, pillows, recycle, sewing, sofa cushions, tea towels on September 1, 2012 by mlwilkie. what a great idea! beautiful ‘fabric’! Michelle is a self-taught designer, quilter and enjoys teaching. She lives in North Carolina with her husband and son. You may re-post or share any content, photos or designs from this blog but please credit and link back to the original content. All designs, content and photos are copyright of Michelle Wilkie unless otherwise noted.